Herodotus (450 BC) wrote a monumental prose history of the Persian empire, which focussed on the period after 580 BC (the Achaemenian dynasty). In it, he is said to have written the first description of the gardens (or not, or to have mentioned unspecified wonders). So we already have a conflict of opinion, and we can't decide what to do with Herodotus until we resolve it. The only way to find out what he actually did write is to read the history itself, which we can do on the web. Project Gutenberg gives the full text as translated by G.C.MacAulay, 1890 (relevant section pasted below), and there is also a nice illustration largely based on it by Fischer von Erlach. Better still, below is a Hungarian stamp from 1990 that is based on Fischer von Erlach's reconstruction, and the use of colour makes everything much easier to see. 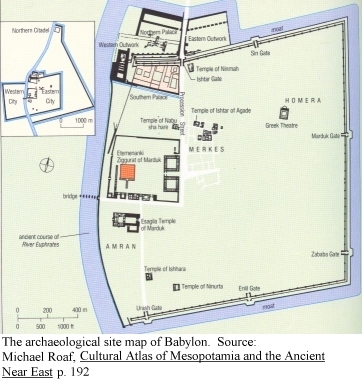 Reading Herodotus' description (pasted below, in brown), you'll see that what he described was Babylon itself. If you try to sketch out the city plan as he describes it, it can be done. What's more, it's pretty accurate in relation to archaeological maps. In the plan below, Herodotus' Temple of Zeus Belos (Tower of Babel) is the central building coloured orange, and above it is his King's Palace (the Northern Citadel) where we'd look for the Hanging Gardens—assuming they existed. As we have seen, Herodotus' description is problematic because its measurements are so huge and there are so many gates in the walls, and because it does not mention the gardens. But those problems tend to melt away on closer attention. 178. Cyrus, so soon as he had made subject to himself all other parts of the mainland, proceeded to attack the Assyrians. Now Assyria has doubtless many other great cities, but the most famous and the strongest, and the place where the seat of their monarchy had been established after Nineveh was destroyed, was Babylon; which was a city such as I shall say.--It lies in a great plain, and in size it is such that each face measures one hundred and twenty furlongs, the shape of the whole being square; thus the furlongs of the circuit of the city amount in all to four hundred and eighty. 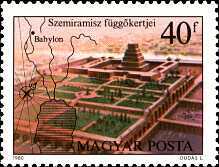 Such is the size of the city of Babylon, and it had a magnificence greater than all other cities of which we have knowledge. First there runs round it a trench deep and broad and full of water; then a wall fifty royal cubits in thickness and two hundred cubits in height: now the royal cubit is larger by three fingers than the common cubit. 179. I must also tell in addition to this for what purpose the earth was used, which was taken out of the trench, and in what manner the wall was made. As they dug the trench they made the earth which was carried out of the excavation into bricks, and having moulded enough bricks they baked them in kilns; and then afterwards, using hot asphalt for mortar and inserting reed mats at every thirty courses of brickwork, they built up first the edges of the trench and then the wall itself in the same manner: and at the top of the wall along the edges they built chambers of one story facing one another; and between the rows of chambers they left space to drive a four-horse chariot. In the circuit of the wall there are set a hundred gates made of bronze throughout, and the gate-posts and lintels likewise. Now there is another city distant from Babylon a space of eight days' journey, of which the name is Is; and there is a river there of no great size, and the name of the river is also Is, and it sends its stream into the river Euphrates. This river Is throws up together with its water lumps of asphalt in great abundance, and thence was brought the asphalt for the wall of Babylon. 180. Babylon then was walled in this manner; and there are two divisions of the city; for a river whose name is Euphrates parts it in the middle. This flows from the land of the Armenians and is large and deep and swift, and it flows out into the Erythraian sea. The wall then on each side has its bends carried down to the river, and from this point the return walls stretch along each bank of the stream in the form of a rampart of baked bricks: and the city itself is full of houses of three and four stories, and the roads by which it is cut up run in straight lines, including the cross roads which lead to the river; and opposite to each road there were set gates in the rampart which ran along the river, in many in number as the ways, and these also were of bronze and led like the ways to the river itself. 184. Of this Babylon, besides many other rulers, of whom I shall make mention in the Assyrian history, and who added improvement to the walls and temples, there were also two who were women. Of these, the one who ruled first, named Semiramis, who lived five generations before the other, produced banks of earth in the plain which are a sight worth seeing; and before this the river used to flood like a sea over the whole plain. Charles Rollin (1661-1744), University of Paris; his Ancient History is much used online because copyright has expired. But note: new findings often render earlier historians obsolete. Rollin's claims must be checked against current research.